Our third foray into South America did not disappoint. While we normally venture south to go hiking, climb a mountain or do some other sort of adventure that involves massive amounts of will power, this time around we traveled down to Bogota for food, drinks and explosives. 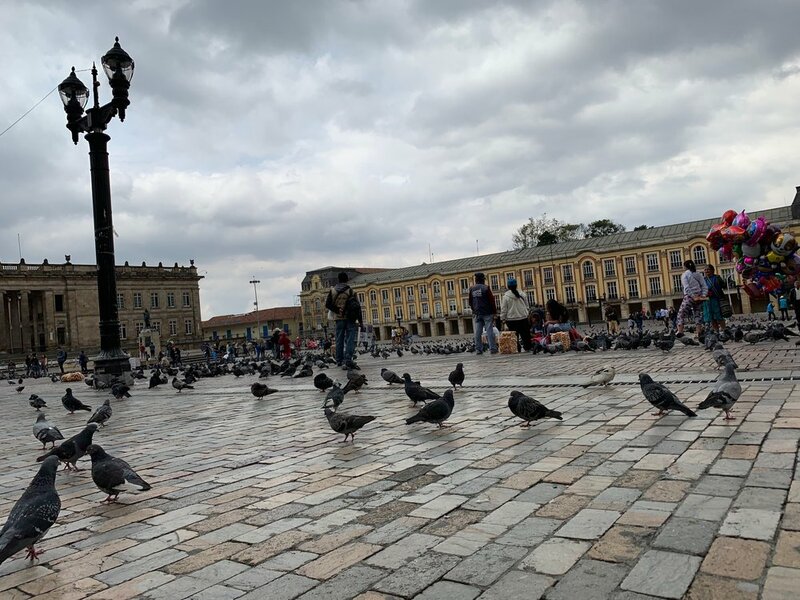 While Bogota is a massive capital city, if you pick a cool neighborhood, you can an easily explore it on foot for a couple of days to get yourself a primer into what is sure to be a long relationship with Colombia. After their peace treaties with the para military and the narcos, tourism is starting to slowly increase in Bogota. We did see a fair amount of young gap year travelers but not many people our own age (the ancient 30’s in comparison to those 20 something hostel patrons). So, if you’re down there for a quick dip into Colombian culture, here if your 48 hour itinerary! 1.) Be sure to drop by La Puerta Falsa for a breakfast of tamal and chocolate completo. Touted as the oldest restaurant in Bogota and situated next to Plaza de Bolivar, be sure to sit up in the loft area to get a look at the table where Anthony Bourdain sat on his show, Parts Unknown. Just so you know (because I also didn’t know) the bread and the cheese are meant to go into the chocolate. The food was amazing. The quick, no nonsense atmosphere was amazing. I also really enjoyed getting to practice my Spanish in a fast paced environment. The menu is pretty small so the waiters are pretty much expecting you to already know what you plan on getting. Here is Anthony’s table. The strange thing is is that it is not marked at all. No photos, no plaque, nothing to denote Tony was ever there. Most bars and restaurants he has been to has his image somewhere. One restaurant even has his table encased in glass. Justin very ready to dig into his giant tamal and wishing for me to stop taking photos already. 2.) After breakfast, grab yourself a warm canelazo and take walk to Plaza de Bolivar. Here you’ll usually find some various arts and food vendors and occasionally someone will ask if you want your photo taken with the mass of pigeons. I mean, do it if you’d like but they’ll land on you since they typically put some type of bird seed in your hands. So, if you’re down for being covered in dirty birds, go ahead. 3.) Grab yourself some ink at El Agujero Tattoo by Camilo Joya. Located way up a steep hill and tucked inside a small, nondescript shop front, you’ll be intrigued the moment you step into the small cafe/bar/tattoo shop. Something that North America doesn’t do too much is create a tattoo shop attached to some other type of endeavor and every time I see one, I’m instantly drawn to it. Down a beer or coffee before you climb the spiral staircase to the tattoo shop upstairs while old school punk plays in the background. Being near the equator, the weather is often the same 50-60 degrees F so you’ll find lots of open windows and doors in Bogota. 4.) Once you’ve gotten your ink fix, check out Antigua Santa Fe located literally just down the road at the bottom of the hill and you can stand in front of where one of the kidnapping scenes in Narcos was filmed (insert obligatory Netflix Narcos reference). I highly recommend getting the ajiaco or the bandeja paisa. The ajiaco is a local and much beloved in Bogota chicken soup filled with capers, corn, tubers and other goodies. It normally comes along with a giant avocado and a pretty healthy serving of rice. Basically this is all of my favorite combinations of food. Bandeja paisa is lovingly considered hangover food as it’s mainly composed of various fried and super heavy meats. You need to have this. Hungover or not, you must eat all the fried meats. The aforementioned obscenely named salsa. Unfortunately, at this moment it’s about half way gone and, as a spicy food enthusiast, it’s probably some of the best hot sauce I’ve ever had. We learned how to make empanadas! Empanadas will forever be my favorite fried goodie. We were in desperate need of help so the local young boy of the house taught us how to make them properly. 5.) 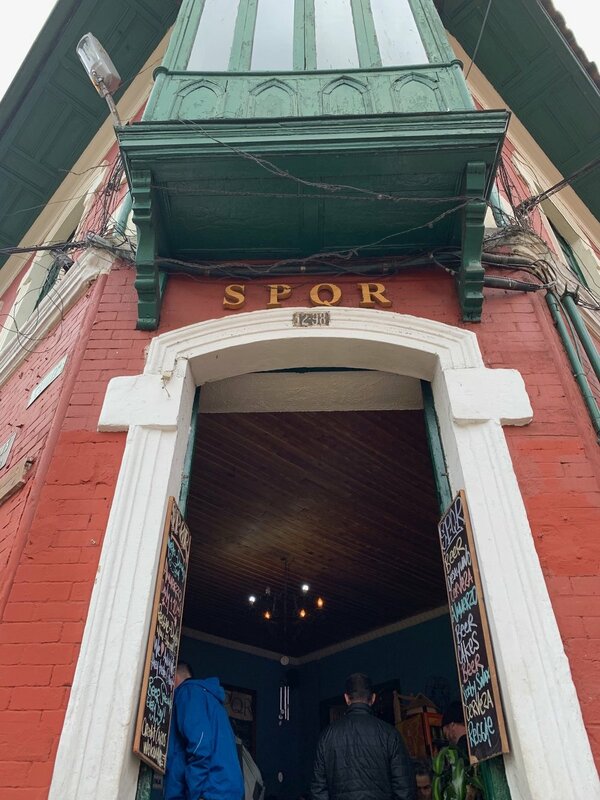 After you stuff yourself with food, food and more food, be sure to go on by SPQR to check out the chill, hippie vibe and grab a famous lemonade and coconut juice. It sounds like a weird combination but it’s really awesome. The owner/chef/local dj is a pretty cool guy to talk to while you’re deciding which local juice or beer you’d like to try. I also highly recommend dropping by for breakfast on your second day. Super good people watching and super good juice. 6.) Go anywhere and grab yourself a Poker. It’s not a super beer but it’s necessary. In my personal opinion, it’s lots of fun to travel around and try the local version of Bud Light. 7.) A MAJOR must do while you’re in Colombia is playing tejo. Beer, explosives, loud, drunk people. What is not to love? We went to Campo de Tejo Los Bucaros on a suggestion from the owner of SPQR. If you’re cool with walking through some kinda sketchy areas, then definitely walk yourself right on over there. Essentially the goal is to either hit one of the explosive triangular envelopes with the tejo (the metal object you throw) or to land it squarely in the middle. Honestly, Justin and I were not keeping up with points in the slightest as we mostly just wanted things to go boom. This is the clay palette that holds the explosives. The patrons of Bucaros were pretty helpful in showing us how to play. Also, the guy who was running the joint gave us lots of little explosive envelopes so that hopefully we’d at least hit one! Typically there is only four on the clay. We had about….a dozen. It’s a lot more difficult than it looks. I only hit one! A must do is order a massive amount of beers and play tejo with all your friends for hours. It was nearly midnight so notice the several lack of people. Probably my favorite experience while we were in Bogota was playing tejo. No one spoke English so I really got to practice my Spanish (and subsequently be laughed at because, as I was told, my Spanish sounds like a proper old grandma’s Spanish). With the loud Latin music blaring, the shotgun blasts of the exploding triangles and the drunk yelling of fellow tejo patrons, it’s an absolute bucket list thing for sure. 1.) Check out SPQR for breakfast if you’ve met your fill on eating the traditional breakfast food, tamal. They have eggs benedict, pancakes, juices and lots of vegetarian options. Listening to the reggae piped throughout the restaurant you almost feel that you’re on a tropical island instead of in a bustling city situated in the mountains. 2.) Once you’ve gotten some good food in your belly, it’s time to go check out the historic neighborhood La Candelaria. Here you can see traditional houses, cobbled streets, tiny tiendas and hippie shop upon hippie shop. We’ve found that nearly all cities, seaside villages and exotic mountainside towns have some sort of hippie enclave surrounded by hostels, bars and dread salons (which we all know i’m envious of). Of course I’m naturally inclined to gravitate to these areas, of course. 3.) Hike or take a tram up to the church on the hill, Monserrate. You’ll actually see no pictures of this because we actually didn’t go. We intended on going but when we huffed our way up the hill to the entrance of the even larger hill, the line was so long that we would have been standing there for an hour at least. The next day was a holy day and we were not even going to kind of attempt going. It’s a beautiful and important place in Bogota, however, so if you get the chance, definitely go check it out. 4.) The best way to get to know someone’s culture is by trying their street food. For lunch, hop around to various ajiaco and arepas vendors and get to know the foods of Colombia. You’ll see fried corn, chorizo, empanadas, arepas….and more, more, more. My favorite is pretty much anything with chorizo and/or fried stuffed things. I wish I could have smothered these arepas in the obscenely name salsa. That would have been sooo good. 5.) Go on a beer tour with Airbnb! We went on a very lengthy and very informative beer tour via Airbnb that also met at the Cranky Croc hostel. Definitely make sure you eat beforehand because you’ll be trying 6-7 pints of beer. If you’re a lightweight this will be a difficult tour :P. I consider myself to have a bit of a sailor’s tolerance when it comes to beer so I held in there but I can’t imagine someone else being so lucky. 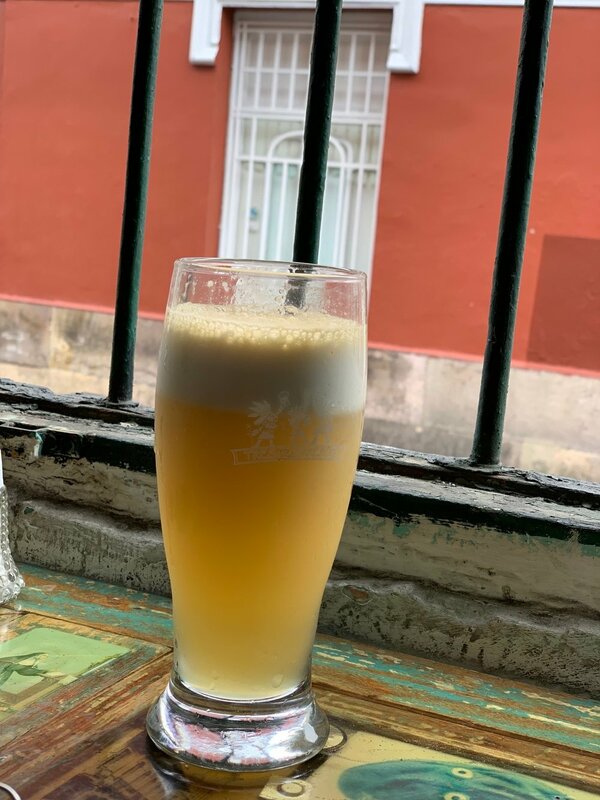 The microbrewery scene in Colombia is really up and coming so be sure to check out some local brews. Our host for the beer tour was super informed and helpful in answering all of our million, annoying questions. 6.) To wrap up your day, check out the absolutely, ridiculously tasty Papaya. Situated in a tiny little shop in La Candelaria, they offer up Mexican food with loads of spices and salsas. To be honest, food in Bogota really depends on the ingredients to transfer the flavor rather than spices, salsas or anything else. I’m big into Meixcan street food so I was missing the spice in a lot of the food in Bogota. This place, however, really hit the spot and it was the last place we went before getting ready to wake up at 4am for our flight. The owner is pretty cool and his mom is in the kitchen cooking up your delicious burritos. We just happened to stop by this super awesome find! Someone obviously has a graffiti background. Do yourself a favor and go visit Bogota. We definitely plan on going back to visit more of the country as each corner is more varied and multi-faceted than the last.